Of The Left Hand And Bass Drum. Composed by Roy Burns. Edited by null. Arranged by edited Houllif. Percussion Methods. Book. Kendor Music Inc #21194. Published by Kendor Music Inc (KN.21194). 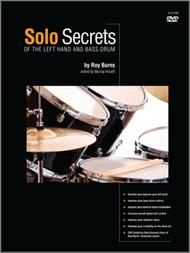 Based on the drum set artistry of Roy Burns, this fantastic book will improve the drummer's left hand technique, bass drum control, hand-to-hand coordination, overall speed, and rhythmic creativity in any playing style or idiom. Solo and fill-in playing skills are enhanced through use of the entire drum set. Edited by percussionist and well-known educational composer Murray Houllif, this 35-page book includes a DVD featuring Roy Burns' amazing final clinic in 1989. The video can also be viewed by clicking here.